Thanksgiving dinners with my family are big, noisy, delicious affairs. My mom and dad usually prepare the turkey and dressing and the rest of us bring an array of side dishes to make an enormous feast. I love this event and try to bring something different every year. Today’s scrumptious rice dish is one of the recipes that, inspired by rice salads of Thanksgivings past, I created for my family last week. I am happy to report that it was a huge hit and sadly there was very little left over to take home. All of the colours and ingredients remind me of fall and I just couldn’t resist showcasing them in a bright, orange pumpkin. This is a wonderful accompaniment to roast turkey or chicken, or eat it by itself for breakfast or a snack. I did! I am bringing a big pumpkin stuffed with this lively salad over to Angie’s Fiesta Friday. Yeah, Friday is here and we are so ready to head over to The Novice Gardener for some R and R. If you haven’t yet visited Fiesta Friday, the hottest blog party in the blogosphere, you really should. We all bring a little something to share, be it a recipe, some music, poetry, or whatever you are passionate about. Today, my very talented blogging buddy, Hilda of Along the Grapevine, and I are very excited to be co-hosting. Just let either of us know if there is anything we can get you! Fresh plate? Something to drink? Directions to the loo? We are here for you! For any newbies, welcome, and here are the guidelines. To join us, all you have to do is click on the button below. Happy Fiesta Friday to all. This is perfect with roast turkey or chicken! Rinse the wild rice in cold running water. Place in a medium saucepan with 2 cups water and ½ teaspoon salt. Bring to a boil over high heat. Cover and reduce heat to low and cook for 35 to 40 minutes, or until the rice is tender and the water is absorbed. Set aside to cool. In a large skillet, sauté the onions in 1 tablespoon olive oil until they become translucent. Add the garlic and sauté until the garlic becomes fragrant. Set aside to cool. Toss the butternut squash cubes with 1 tablespoon olive oil. Season with salt and pepper. Place on a parchment-lined baking sheet. Roast for 20 – 25 minutes until they are cooked and golden. Set aside. Be sure to double the recipe if you want leftovers! 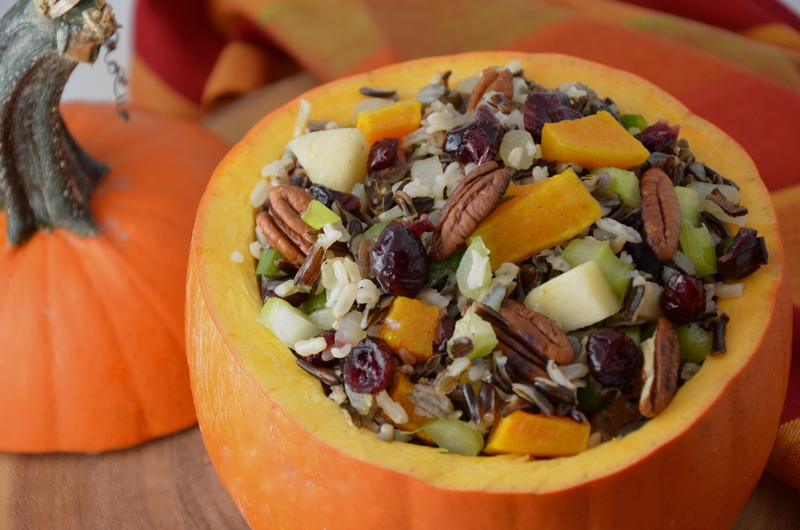 I love this salad and the presentation is so beautiful, perfect for the Fall. This looks delicious Juliana! Love the pumpkin serving bowl. Very seasonal and festive. hooe you had a nice Thanksgiving. Thanks for hosting FF! Thanks so much for the reblog, Chef! I really appreciate it! Sounds like you have a wonderful time and a fantastic feast Julianna. Your wild rice salad looks so vibrant and sounds so delicious – I am not surprised that there was very little left! Thank you for co – hosting us again this week; Happy Fiesta Friday! 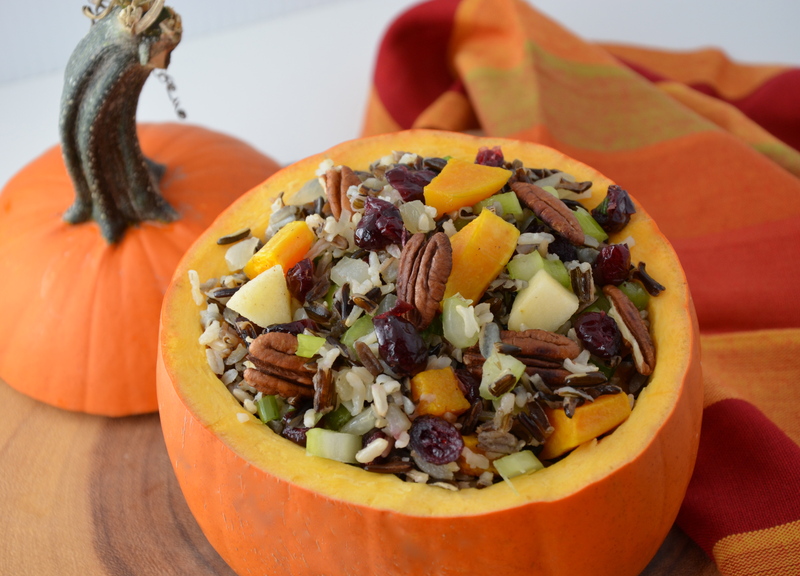 Delicious, Fall captured in a bowl. Thanks for hosting. Hey that would be a great name for this dish, Tracey! I should have called it that! My pleasure to co-host! A gorgeous salad with so many flavours of the season. I see we are going to have fewer dishes to wash after the party than usual with all these vegetable vessels. Well done again! Woohoo, way to make an entrance Julianna! Love that gorgeous salad and the presentation in a pumpkin is genius!! Hope you had a wonderful thanksgiving 🙂 Happy FF! So glad you like it, Naina! I did have a wonderful Thanksgiving! I think you live in Sweden, right? Do you celebrate Thanksgiving? I adore this, such a fab idea and perfect for autumn and thanksgiving, either of them! Oh, thanks so much, Melissa. I appreciate it! So glad you like it, Ginger! I really love these colours – so warm and cozy! And I do agree about the virtual parties! Fall is pretty much upon us here in BC! The weather is warmer than usual, but it’s definitely fall. Have a good week! I feel like grabbing that bowl now, it looks so good! Thank you for hosting the party this week too, Julianna. You and Hilda rock! This looks amazing! I love all of these flavors and its gorgeous displayed in the pumpkin. So glad everybody loves the pumpkin! I’m no good at carving jack-o-lanterns, but, I know how to stuff ’em ! Thanksgiving is something quite new to me, since we don’t celebrate it in Italy. I have to admit that I’ve immediately appreciated the tradition you have for celebrating it, especially those related to food! The rice you made looks very tasty and very healthy too… love the presentation you came up with! I hope you’ll have a great we! What a creative and yummy salad idea. Looks so festive too! Thanks for sharing the recipe, Julianna. Thanks so much, Sandhya! My pleasure! Thanks so much! Really glad you like it! Oh wow! What a gorgeous dish Julianna and so beautifully presented in the pumpkin! Hope that you and your family had a very happy Thanksgiving! It was a wonderful Thanksgiving, Margot! Really happy you like this recipe! 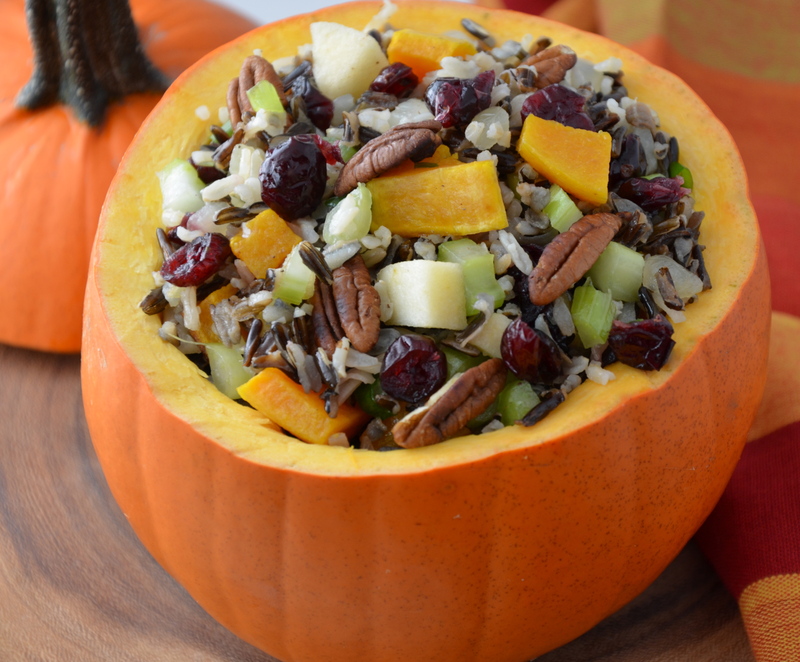 Love how you used the pumpkin as a bowl! Great idea! Looks so delicious and so well presented. Love the festive presentation, Julianna! Beautiful dish, beautiful ingredients and sounds so delicious too!